The slave who is wise is one who constantly remembers the favour of his Lord. Such is one who is continuously blessed. Remembering Allah is so easy yet brings so many rewards. We can repeat the authentic words from the Hadeeth. One of such is, “Two words are light on the tongue heavy in the balance,beloved to the Merciful: ‘Subhanallah wa bi hamdih, Subhanallahil Adhiim’ Glory be to Allah and by His praise. Glory be to Allah, the Immense. (Bukhari). We could moisten our tongues with Tahleel(La ilaha ila llah), Tahmeed(alhamdulillah) and Tasbeeh(Subhanallah). We could find a quiet corner and reflect on Allah’s countless favours upon us, ponder about His creation and how He has power over all things. Whilst trying as much as possible to keep thoughs of Him as close to our forebrains as possible, we would find that our minds and bodies become fresh and our hearts become purer with no room for evil. Constantly remembering Allah and reminding others of the same will keep us from sins and help us get the best of our lives. Hmm, this is a tough one. I, like many others find it a daily struggle. How does one add the work of Ramadhan to everyday rigours? From a moral point of view, this post should be left for the highly qualifies- those who have succeeded at running their schedules as opposed to their schedules running them. One concept must be noted here. the inherent rewards in Ramadhan can not be attained if one does not strike a sort of balance. Moreso if one does not have the luxury of a holiday. You must be ready to cut back on sleep. Coupled with the obvious reduction in food intake, (I am not including the Ramadhan binge eaters here) energy must then be sourced from another store-the mind. *Avoid all vain useless talk. Ask yourself,”Is this gist worth it?” You would be protecting yourself from sin too! *Plan your shopping trips well. Time spent in the markets and malls can be used for extra recitation of the Quran. *Try to cut back on post-Fajr sleep. These innocuous naps can extend till Dhuhr. You therefore miss the benefits of Duha and risk denigrating the essence of your fast. *Resolve to continue with this after Ramadhan. If only you could strive harder, you would find that twenty four hours is really enough. We just have to plan and plan and then be strong enough to follow through with it. This way, the daily routine of Tahajjud, Sahur, Fajr, work,Salah, Tafsir, Quran, Nawafil, Visitations,Iftar, Tarawih, and even Laylatul Qadr will be more achievable. Our spirits will then be lighter as there will be less regrets post-Eid. It is a thing of joy to know that at the end of this month, your sins will be forgiven by Allah the Forgiver. Many devote a certain part of the day to saying endless ‘Astaghfirullah’ in hopes of getting a clean slate. This is part of the Mercy of Allah. What is often ignored is that while we are so hopeful of our repentance being accepted by Allah, we do not extend this courtesy to those around us. The nerve! No matter how big we perceive the wrongs of others towards us, the gravity can’t be compared with that of transgressing the bounds of Allah. And while we feel entitled to constant good treatment from others we have placed ourselves on an impossible pedestal. For Allah knows that many of His creation will disobey Him even though He is most deserving of their obeisance at all times Yet He forgives those who seek repentance and even those who don’t! Why then do we hold grudges? Why don’t we let things go? Little do we realize that when we try forgiving, we really are doing our own selves a favour. The pain eases faster and then we can move on. Let’s not put the keys to our happiness in the hands of others. Else they will control our feelings and reactions. We must seek forgiveness with renewed sincerity. make a resolve to avoid committing sins and have hope that our repentance will be accepted by Allah. Doing good deeds, offering two rakat for this purpose, performing Wudu’ properly, giving to charity; are some of the numerous ways we can achieve this. Imaan is not complete without Tawwakul. We claim to have faith but act like we do not trust Allah to take care of our needs. In our hurry to get what we want, we lose sight of the lesson of patience. When we ask Allah we should do so with total conviction that he will do what’s best for us. Let’s make Dua for ourselves, our deen, loved ones,careers, neighbours, strangers and the needy around us. We should not just ask for material things only but pray for character and deen improvement, better understanding of the deen, and then the ultimate goal-Jannah. Among the things we should strive towards if we want our Dua answered are repentance, avoiding unlawful acts, a lawful source of livelihood, and good behaviour towards people. With these and sincerity,it is hoped that we get beautiful answers to our Dua. Never underestimate the power of supplication. Isn’t it funny how when we are asking Allah for something we are so expectant and feel bad when we do not get it? Yet when others ask of us, we become reluctant, we try to justify, we hesitate we sometimes even judge and call these people ‘beggar’. The concept of Sadaqah is to help others in any way possible. It could be a kind word or substantial wealth. It is a means of achieving social justice. This is because the rich one is reminded that wealth is a blessing and the poor knows that he is not forgotten. It is a core part of the essence of a good Muslim to always give to others. Give food to the hungry, clothes to the unkempt, help a family with Iftar and Sahur, give the beggars, be nice to everyone, greet people with a smile. Don’t make the mistake of thinking, “But I am poor myself and in need of Sadaqah.” You can give a smile! You can be a listening ear to a troubled heart, assist someone in distress. There are so many ways, even a head of the household taking care of the family is giving Sadaqah. It is also not restricted to the poor alone. Be kind to everyone and aspire to keep at it all year round. The past seven days have been wonderful in so many ways. One of these is the renewed bond with the Quran. There is this beautiful humming sound that emanates from the recitations of so many people. The book-month relationship wouldn’t baffle you if you realize that the Quran was revealed in this month. Busy as we are nowadays it isn’t so easy to complete it even once without much discipline. Abundant reward lies in not just the recitation but pondering over the meanings, working on memorization and trying to live by it. 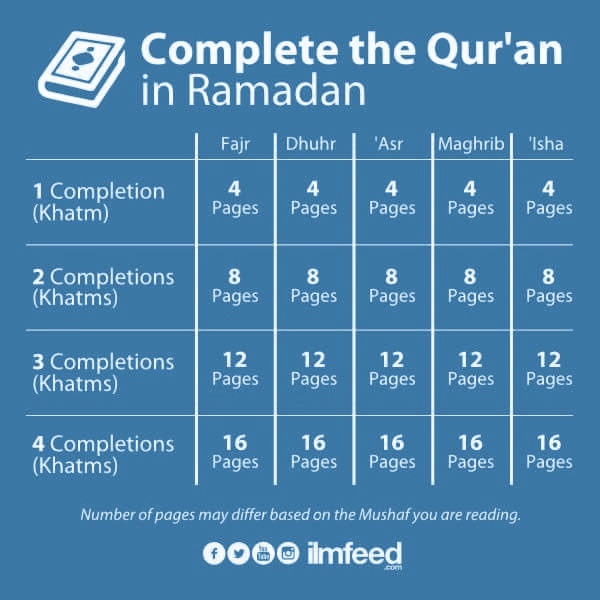 The photo above (via Ilmfeed) is a guide to completion of the Quran in Ramadhaan. That inexplicable feeling of peace only comes when we concentrate while reciting and believe the Quran is the word of Allah(SWT) whose message is a guide for us. For brothers and sisters still not able to read Arabic, please get a copy of a translation and help your soul to some enrichment. It’s the fourth day already! A season of feasts and much dining, Ramadhaan is that time when one almost never lacks a meal for Iftar and Sahur. In as much as this is part of the bounties of the month, care must be taken to make sure the right food is consumed both in quantity and quality. Fasting itself aids in clearing the body of toxins and helps the digestive system among other medical benefits(if performed at certain periods). However, we tend to lose out if we cram our mouths and stomachs so full that it becomes a source of discomfort. Heavy foods should be avoided at Sahur as they weaken the body. A light meal containing the main classes of food with adequate water is better. For the aim is to give support and follow the Sunnah not combine breakfast and lunch! Iftar is the time when the major food blunders are committed. People organize feasts and sometimes food is wasted. All this occurring when the needy don’t have any. Dates were preferred by the Prophet S.A.W. for breaking the fast. Apart from the sugars that replace those lost during the day, they are also a rich source of antioxidants, dietary fibre,vitamins and minerals. Next is water to fight dehydration. Then any local food of choice should contain the major nutrients in the right amounts. The nostalgia one feels when one recalls meals of ogi and akara/moinmoin, yam and egg, etc from childhood. Ramadhaan is not a license to eat fatty foods, take fizzy drinks and all the excesses we all try to avoid on a normal day. Below is a sort of guide. Onions, ginger, spices can be added to dishes. Don’ forget to brush your teeth afterwards. Especially if you are going to the mosque for Tarawih. Sodium glutamate (stock cubes) and salt on the other hand should be watched closely. Fruits and vegetables are affordable and availableand should be added generously to the diet. Water! instead of fizzy,sugary drinks. Children deserve milk and should be allowed to drink as much as they want. We can help prevent hypertension, high cholesterol,constipation,dehydration, malnutrition, some cancers and diabetes if we all try to modify our diets. On a final note, try not to overeat. You dont want to get obese in a month that teaches us what poor and hungry souls have to contend with every day. It only leads to bloating and sluggishness in Isha and Tarawih.